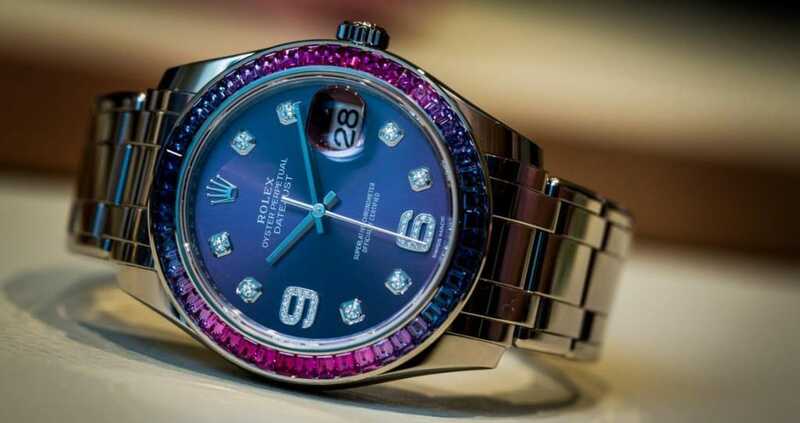 With more color offerings than a packet of Skittles, the new sumptuous Datejust Pearlmaster 39 watches from Rolex are for the ladies who celebrate vibrant shades. Part jewelry piece, part precise timekeeping instrument, the new versions of the Datejust Pearlmaster 39 are offered in a bold 39mm size, confirming that sometimes bigger is indeed better. Making their way onto the scene at Baselworld 2015, the new ladies Rolex Datejust Pearlmasters are crafted in 18k yellow or white gold, and are created at Rolex’s own foundry. Apart from boasting a myriad of in-house workshops, ateliers, factories, and labs, Rolex also runs its own gemology laboratory charged with selecting only the finest gems worthy enough to find a home on a Rolex timepiece. The Datejust Pearlmaster 39 comes in many different variations. For the Datejust Pearlmaster 39, Rolex’s master gem-setters set 48 baguette-cut fancy pink, fancy green, and fancy orange sapphires upon the bezels of the collection’s various models in a circular color gradient pattern around the coordinating colored dials. 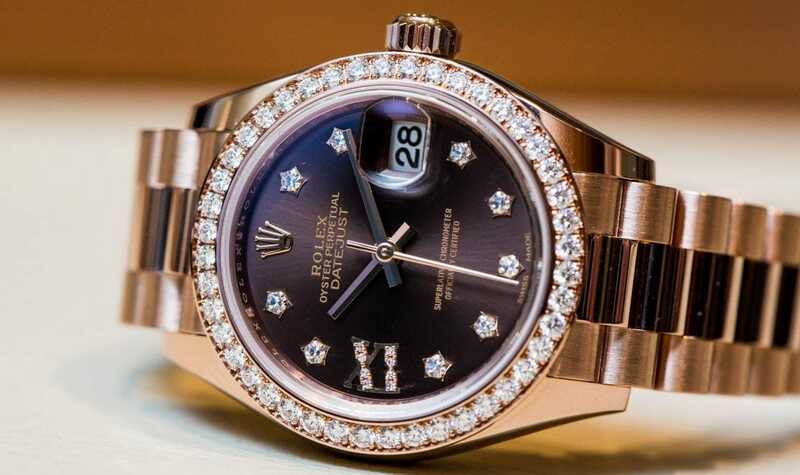 On the dials – in red grape, olive green, and cognac – diamond-set hour markers including a diamond-set 6 and 9 shine bright, while for those looking for even more sparkle, Rolex is offering versions of the Datejust Pearlmaster 39 with full diamond pavé dials and diamond set bracelets. The new models are presented on a solid gold Pearlmaster bracelet with rounded solid links. The rainbow gems and color dials of the Datejust Pearlmaster 39 are housed on a solid gold Oyster case, waterproof to 330 feet, which is made possible by its watertight caseback and screwed down winding crown outfitted with the Twinlock double waterproofness system. Protected by scratchproof sapphire crystal, the dial also boasts Rolex’s characteristic Cyclops lens at 3 o’clock for optimal legibility of the date. The technical expertise invested into the Oyster case of this timepiece means it can safely accompany wearers on beachside adventures and tropical getaways. Beneath the beauty of the Datejust Pearlmaster lies another masterpiece — the new Rolex Caliber 3235. Entirely developed and manufactured by the expert watchmakers at Rolex, this new self-winding mechanical movement features 14 patents, superior precision, and up to 70 hours of power reserve. Within the new-generation movement is a new Rolex-patented Chronergy escapement made from nickel-phosphorus materials, making it resistant to magnetic fields. The Caliber 3235 also features Rolex’s exclusive blue Parachrom hairspring, which is impervious to temperature swings and is up-to ten times more resistant to shocks than a traditional hairspring, allowing for even greater precision. With its fearless bold looks and lavish luxury, and accompanied by a superior mechanical movement within, the new Oyster Perpetual Pearlmaster 39 models breathe fresh excitement into Rolex’s new lineup of timepieces for her.